This wide ranging interview took place at the Stanford golf course Nov 20th, 2007. An 8-part video of this interview is available on this website at http://stanfordmensgolf.com/video-Tatum.htm. Interviewer (Lyman Van Slyke, with Bob Stevens and Richard Peers): This is November 20th, 1 p.m. Sunny day at the Stanford Club House looking over the 18th green, back down the 18th fairway. You must have a lot a fond memories of coming down that fairway, Sandy. ST: Well, I say I do. You know, this golf course is just loaded for me with fond memories. ST: You stand up on that 18th tee and see the panorama of this area and this wonderful golf hole out in front of you, that’s a really stimulating experience. I: It’s a good finishing hole too, don’t you think? ST: Oh, absolutely. Wonderful! The bombers have made it less effective, somehow we have to deal with the bombers, but that’s not the subject of this meeting. I: Well, we are obviously focused on Stanford golf, but in an expansive, rather than in a narrow way. I think we are interested in the broader lives in which golf was embedded importantly. Maybe we can start by your telling me how you got started with golf and what fascinated you with playing golf. ST: My father was a dedicated golfer and a good one. I think he probably reached the point of being a 4 handicap. I was the youngest in the family. I had three siblings, two brothers and a sister. It was a very important part of my father’s life and remarkably enough, he worked on those three and didn’t get any one of them interested in golf, which I think frustrated him seriously, but he found me, and he found me basically at the age of 6. He was one of the very early members of Bel-Air Country Club down in Los Angeles. In those days, there weren’t very many people playing the golf course on Sundays. So he would take me along with him. He gave me a couple of sawed-off golf clubs and a couple of golf balls and said, “just stay out of people’s way and when you get tired, go sit in the car.” He then would have his game and many hours later, my having been back and forth to the car maybe four of five times at least, he would turn up and we would head for home. Remarkably enough, at the age 6 I thought that was a swell way to spend a Sunday. There is no question that my own perceptions of how much the game had contributed to his life was a prime factor that made the game truly attractive for me. There is fundamental attraction in it, isn’t there? Once you get one airborne, and particularly if it goes somewhere where you think it’s going to go, something very clearly useful happens. So I learned from there. He was experienced in the process enough so that he realized that he had hooked me. So what he did was to make it a reward for performance, scholastic and otherwise. He would evaluate me, how I performed and if I performed effectively, I got to play. That was, of course, an additional incentive which had something to do, for certain, with regard to my understanding of the efficacy of effective performance. He then got me into a posture where I could caddy for him. That was a very defining experience for me because then I was really out there sharing the game with him and it just further inculcated in me the values and attractions of the game. There was of course the other element that is really important. This is my father and he and I had a very very effective relationship. I: What was your father’s profession? ST: He was a real estate broker. He paid me fifty cents a bag, fifty cents for a round of golf caddying, and I was overcompensated I thought, but I loved it. Then from time to time, as I grew a little older, a little stronger, he would be playing and he would arrange for me to double caddy, so I would be carrying his bag and the bag of somebody he was playing with, and that meant I made a buck, which certainly was useful! So those experiences were all very very positive. I think probably one of the most expressive ways of identifying his views of the values of the game was an incident that occurred when he had upped the performance criteria as we went along and the ultimate criteria, that is the performance had to be good enough, so that we could arrange a game with another father and another son, and the son was a friend of mine and we had played some golf together. So, the four of us went out on a Sunday at the Wilshire Country Club, where my father was then a member. I have a very vivid memory that on the 5th hole, I hit my second shot into a baranca crossing the fairway. I had about five clubs and one of them was a hickory shafted 6-iron. I took a swing with the 6-iron and the ball caught the top of the bank and came back. I, in a state of frustration, threw the club and it bounced off the bank and came back to me. I extricated the ball, and played on. As we were walking up toward the green, my father suddenly appeared alongside me, and he very quietly said, “You will not say anything to anybody. You will pick up your ball. You will go back to the club house and you will sit down in back of the 18th green and you’ll stay there until you are told what to do next.” So, I picked up my ball, I went back. Wilshire had two 9-holes, one on each side of Beverly Boulevard, and this was on the north side, so when they came through on the 9th, I saw them. I saw them playing the 16th and saw them play the 18th. They went into Club House and I sat there, and it got dark. I had been there for a long time, when the steward came out of the locker room and he said, “Your father says you can now go sit in the car.” So, I went and sat in the car. In due course, a little while later, he came out, got in the car, started it up, didn’t say a word. At about halfway home, he was focusing on the road, he said, “I only have one question. Will you ever ever again ever throw a golf club?” I said, “No, sir. I never ever ever again will throw a golf club.” And while there were provocations subsequently, I never could let go of it. That told me a lot about his values with regard to how you conducted yourself. It was a very valuable lesson. And so it went, and he encouraged me in all of the ways that he could encourage me, but he made it a discipline, rather than a picnic. I: Did you have a teacher in your early stages of golf? ST: No, I just observed, mostly observed him, but observed. I got to be pretty good as a youngster, certainly good enough so that boy I loved to play. And there were a couple of summers where, I don’t remember why, I had access to the golf course and there was a group of us, about six kids, about my age. And again, in those days, the courses weren’t particularly crowded, and we, particularly during the week, would frequently play, successively, at least 54 holes a day, and more if we could get it in. So there was a community of us, and that had a lot to do, for me, in terms of how I related to the game. I: So it was mostly play and not practice as we think of it; going down to the range and hitting a bucket of balls. ST: No, until I got well into my teens, I don’t really remember ever being on a practice range. So that’s how all of the foundations were firmly laid, and as I now look back on a life that’s been so inexpressively enriched by my involvement with the game, it strikes me as the most effective legacy he possibly could have given me. I: I want to get to Stanford here in a moment, and Rich and Bob will of course chime in as they feel appropriate. Listening to you talk about your siblings who didn’t connect to golf in the way that you did, but you did, do you think that there is anything in a kind of personality or temperament that finds fascinating an individual game like golf which, however social it is, is also a solitary game in some ways? Did you also enjoy team sports? Did you play a lot of team sports like basketball? ST: Yes. The two sports in which I participated in seriously were track, in which I ran the high hurdles, not very well, if I may say so, but with an enormous amount of enthusiasm… and football. And football was an important part of my high school experience. I went to Los Angeles High School. What a wonderful experience, in every sense that was, in those days. For that part of the city, it had some diversity in relation to the ethnicity of the people in it. The education was superb in every respect, and it was certainly attractive and the social life, my whole recollection of those teen years as they related to the high school experience couldn’t be more positive. Football was an important activity for sure and I was reasonably good, good enough, so that I played first string. We had a coach by the name of Burt LaBucherie who later was a very successful coach with UCLA for a while and ended up coaching, interestingly enough, at Cal Tech. He was a remarkable personality in many ways. I found him exceedingly challenging and very attractive and tougher than hell, and I liked it. I played quarterback in those days. It was single wing, so the quarterback, most importantly, called the plays, and the quarterback was the lead blocker for these “Fancy Dans” in the backfield that were running around getting plaudits while we were trying to knock people down so they wouldn’t get to them. But the thing that really attracted me about that experience was to be the play caller; I ran the team. In those days, if you were taken out in the quarter, you couldn’t come back until the next quarter. So, the coaches didn’t control the game, we did, and that part of it, that extra part, I just found utterly, completely compelling and fascinating. I just loved being out there by myself. That part of the love affair has certainly stayed with me, because I play by myself, not as frequently as I can, but often, and I can commune better with myself in those circumstances than I can in any other. It did have another dimension in that experience because Howard Hughes was a member of the Wilshire Country Club. A remarkably good player: I would guess, at most maybe a 4 handicap. He had a house along side the 9th tee at Wilshire. One day I was playing out there and I was in a situation where he wasn’t going to be able to see me, but I saw him coming down on to the 9th tee, and following him was Katherine Hepburn. In those days it was a bit of scandal, if I may say so, that Katherine Hepburn was shacked up with Howard Hughes. He would have called the pro shop and say “is anybody on the front nine,” and the pro shop would say no, and he’d say, “okay, send over a caddy.” So they sent over a caddy - the two of them were playing and she was in a pair of slacks. You didn’t see that very often in those days. And she had that beautiful head of hair piled on top of that beautiful face and she was wearing Howard Hughes’ sweatshirt. It was perfectly clear that they were engaged in a very serious competition and she was a pretty good golfer. You have to remember that when I witnessed that scene I was 13 years old and when you consider how the hormones were beginning to go, and there I am looking at that perfectly beautiful creature, shacked up with this guy, it had a serious impact. One other note about that, if you saw The Aviator, it had them playing golf. I considered my exposure to that relationship to be an important piece of information that I carefully protected, but occasionally exposed to people when I thought that it would be useful to do so. I: So, fast-forward, when you came to Stanford, you matriculated in 1938, and you were already a pretty accomplished golfer. ST: Yes, I was a pretty accomplished golfer, a long way to go, but yes. I: Tell me about the golf team at Stanford at that time? In other intercollegiate sports, freshman could not participate in varsity until they were sophomores. What was that state of golf at Stanford when you arrived? ST: In the spectrum of college athletics, it certainly was well behind football and well behind basketball, and some distance behind baseball, but it had a place. One of the reasons it had a place was Lawson Little. After all, he was a Stanford golfer and that certainly had an influence on me. My oldest brother was also one of my heroes. He had come to Stanford and I used to come up here occasionally for a football game. 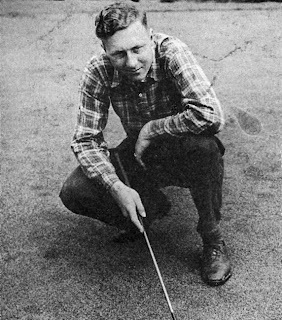 I had the exposure to the institution, but the thing that most effectively attracted me into the golf scene was the fact that Lawson Little played on the golf team. He was a very effective, colorful character in his prime and that was a very significant attraction. I’ll jump ahead regarding Little. 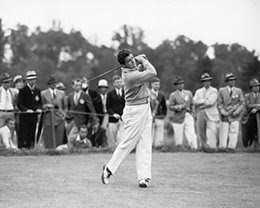 I was very much involved with watching his career with a great of deal interest, and he wins the 1940 U.S. Open. In 1948, I was at Oxford and I wanted to try to play in the British Open. I was good enough then where that was not an unrealistic idea – I’d never come close to winning it, but it was not unrealistic to think that I might be able to qualify to play. In those days, they had a fairly open qualifying. The British Open was at Muirfield and I went up to Muirfield and tried to qualify. I came close, but didn’t make it. But Lawson was there. I had had some exposure to him over the years, but I hadn’t seen him in a very long time and he was there. He announced that he had come because he had won the Canadian Amateur, Canadian Open, U.S. Amateur, U.S. Open and British Amateur, but he’d not won the British Open and he wanted to complete that six. He typically would hold court in the evening and he was engaging and interesting, but he was drinking. I remember that he shot 73-73 in the first two rounds. That night I’m sitting talking with him and he’s drinking remarkably heavily, and I thought to myself, he’s gone. He’s taken this trip for this purpose and he can’t possibly realize the objective and it’s a shame. It’s also, I think, briefly worth mentioning that I had another exposure to him. In the navy, when I got a commission as an ensign, they sent us to indoctrination school at the University of Arizona in Tucson, and there were a thousand of us in five hundred double bunks - as roommates in this gymnasium, and Lawson Little was there. So we crossed paths again. And, of course, at that time, he was not too far from his prime. Oddly enough, a match was arranged for the benefit of the Red Cross. I was paired with Lawson Little and we would play Bob Goldwater, Barry’s brother, and Lee Diegel on a public golf course in Tucson. I have to tell you, when that happened I thought I had died and gone to heaven. I will be Lawson Little’s partner, people are going to pay money to watch and it’s going to go the Red Cross, so it certainly was a seriously defining moment for our relationship. I: What kind of player was he? Obviously he was world-class, considered the finest match player in the world for a period, as I understand it, hooked the ball, but what would you say about his game? ST: He’d hit the ball a long way. I would say, the most effective aspect of his ability was that, boy, he was competitive. This is true of any really accomplished golfer. The competition brought out the best in him and he demonstrated that a lot. There was that British amateur where he was playing at Prestwick, and in the final he won 14 and 12. He started out the afternoon round with six straight 3’s. I: Back in those days, wow! ST: I mean, that’s just absolutely mystical. So, that basic characteristic I think had a lot to do with it, but the lore of it was that he wasn’t number one on the Stanford golf team. I don’t know whether it was true or not, but there was a guy here by the name of Art Doering and Doering was able to beat him here. I: Didn’t Lawson Little carry vast numbers of clubs? ST: We all did. They all did. Yes, you know it wasn’t unusual to find some guy with 23 clubs in his bag. So he wasn’t unusual in that sense. It was amazing how that developed. I: But all that eventually led the USGA and the R and A to limit the number of clubs to 14, something more reasonable. ST: You bet. No, it got out of hand. [chuckling] First, it took a long time to select the club. It was ridiculous. I: You mentioned Art Doering. Did you have any interaction with Art Doering? He’s also a member of the Hall of Fame. I’ve been able to get a little bit of information about him, but not a lot. ST: No, I did not. I was simply aware of him on two counts. One, the most important, that he was said to be ahead of Lawson Little in the golf team here. And they said that he beat Little fairly regularly on this golf course. And then subsequent to his Stanford career, for a while, he was fairly prominent. He could really play, obviously. I: Who was the golf coach when you came? ST: Eddie Twiggs. And, boy, what a break that was for all of us to have Eddie Twiggs. He was one of the more interesting personalities that I have ever met. He was an amateur. He was a member of the Olympic Club. He obviously had a lot of money and the lore was that he had made a fortune in Coca-Cola stock. And he lived a life-style that would indicate that he certainly had a significant amount of money. As, I understand it, golf was just beginning to develop here and he found out that there was an opening for a golf coach. I’m not clear on whether he was the first golf coach or not, but if he wasn’t, he was certainly the second. Al Masters was the Director of Athletics and Eddie heard that there was an opening and Eddie came. He never had any experience other than playing amateur golf, but he loved the game and thought that would be a wonderful way to spend some time. He lied to Al about his age; he was much older than he admitted to be, but he certainly was functional, and he got the job. Boy, he was influential in terms of how he affected those of us who were lucky enough to be exposed to him. He was a total consummate lover of the game. He was a very strong taskmaster with regard to the conduct of his players. He was fastidious in his dress and he insisted that his players be thoroughly well-groomed. Occasionally, we’d have player that didn’t have enough money to be well-groomed and Eddie would groom him. He was an extraordinarily effective purveyor of qualities and characteristics which you needed to be able to be an effective golfer, transcending how you had to swing the golf club. And so the golf teams responded to him because, if I may say so, we were very good. He had one other attraction that is worth mentioning, and that is that Eddie was a bachelor. He was in his 70’s, and those days being in your 70’s was well up there, but he had plenty of energy. Eddie had a girlfriend and Thursday was Eddie’s day with his girlfriend. You have to understand how that intrigued us. When we would go away on a trip somewhere (we never got out of the state, except for the National Championships) ,and every Thursday, Eddie got a long telegram. So there was an element of romance there to add something to our feelings about Eddie. I: It was Howard Hughes and Katie Hepburn, Eddie Twiggs and his girlfriend. ST: That’s right. It picked up again! I: You mentioned that you didn’t go out of state at all. Did you just play competitive matches with local schools? How did that work? ST: There was the Pacific Coast conference in those days, but I don’t recall playing any teams from out of the state. We did have a PCC Championship, but the farthest we wandered was Los Angeles. The only times we went out of the state was playing the National Championships. Having Eddie as a feature and factor in Stanford golf was a very important addition to my experience playing. I: Did he actually coach hands-on very much: I mean swing, course management, short game, that short of thing? ST: Yes indeed, he did. One amusing incident given Eddie’s fastidious feelings about how you conduct yourself on the golf course happened playing down at Lakeside against, I think, UCLA. George Traphagen was playing ahead of me. I was on the tee and Traphagen was playing his second shot and Eddie was sitting on his shooting stick watching Traphagen. There were factors there, in Traphagen’s performance, that obviously had created some frustrations in Eddie because I saw Traphagen take a swing, and Eddie got up, took the shooting stick and threw it into the woods in frustration. It was way out of character! Anyhow…. but, boy we all admired him and he was wonderful. I: Stanford won the National Championship, the records show, in ’38, ’39, ’41 and ’42 before World War II hit. The records show that you played on the ’42 National Championship team. ST: I also played on the ’41 team , but I didn’t make the cut to match play. I: Okay, so you were part of the group that won that National Championship as well. ST: Yes, but I wasn’t one of the four that counted. There were 36 holes of stroke play to qualify for match play. 64 qualified for match play, so that the team championship was determined on the basis of the 36 holes of stroke play. My score was not one of the low four. I: So there was a cut after 36? ST: Well, so to speak. They only took the low four scores from each team. Mine was not one of the low four, but I must say I certainly loved the experience. There was a wonderful attitude and atmosphere about college golf in those days, a lot of which I think has been lost. It’s like almost all of Division 1A athletics has taken a huge piece out of the experience that you have in the cultural, intellectual, social experience in four years of university life – critical part of your life. Obviously you are coming from upper adolescence to young adulthood and what you experience in that context, for most people, I think, is one of the truly defining experiences that you can have. What’s happened now has been that it’s virtually a year-long regimen of playing the game. I’m not being critical of anybody – take Conrad Ray, look at what a fine job he does. But the fact is that I’m glad I’m not here now playing on the golf team, because it would take much too much out of the whole experience for me. 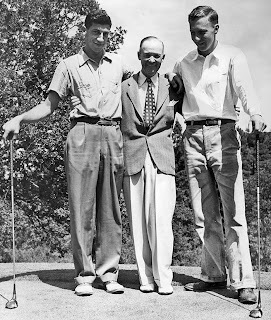 I: Several of the Stanford Hall of Fame golfers were on the ’38, ’39, ’40, ’41 teams. Could you say a few words about Warren Berl, Bud Brownell, for example? I: As much as you like. ST: Particularly when you mention Warren Berl and Bud Brownell. I should pick Berl first. Warren Berl had one of the best golf swings I have ever seen. Period. I’ve been watching now for 80 years. He was a superb human being and a joy to be around, and became one of my very closest friends. Happily we picked up together again after the war in San Francisco, and Warren and I have a very important relationship, certainly for me. He was a superb player and he had all of the qualities and characteristics that add up to an absolutely first-class human being. He could really play golf. So, to have him on the golf team, on which I was participating, was very important in my whole experience. Bud Brownell. Boy, I often think what Bud’s career could have been... Boy, he could play. Just two illustrations: the most dramatic being that Denny Shute was the defending PGA champion and I don’t remember why, but he came here on a cold, wet, tough February day. They set up a game with Berl and Brownell playing with Shute. Shute shot 72, which was a very good score in the conditions. Bud Brownell had 9 3’s and 9 4’s. A 63 in those circumstances(!) and he hit an eight footer into the hole for a birdie on 18 and it came out. I also happened to be playing behind him in the qualifying for the State Amateur Championship at Pebble Beach, and all he shot was 66, which was then the course record that stood for some time; the competitive course record. So, he was a very important factor and a very interesting guy. Unfortunately, he got killed in the war; heaven knows what his career could have been… I had exposure to those two guys. They were friends of mine, and we played golf together. How lucky could a guy get? I: Bud Finger, who eventually became the coach, was also on the team, is that right? I: In ’41, Bud Finger was also a teammate of yours in those days? ST: Yes, he was an interesting guy. He lead a relatively uninhibited life, and he could certainly play golf. Without any question, he was an attractive person, no doubt about it. ST: Yes he was, for a long time. He was a very likeable guy and a very good player. I: So in 1942, you were the individual titlist at the NCAA’s, and you said it was two day of stroke play and then it was a match play? ST: Match play, 64 qualifying. There’s some background there I want to identify because it’s an important part of my own career, so to speak. The team got set to go to South Bend to play at Notre Dame. Notre Dame was the host. Eddie came to us with the very sad news that the Athletic Department didn’t have the money to send us, and so we weren’t going to be able to go. Well I found that absolutely intolerable. So I asked how much money we needed and I was told we needed twenty-five hundred bucks. So I organized a campaign, but before I could do that, I was told, I had to get the President of the University to approve of the process. So I went to see Ray Lyman Wilbur, who was an austere, remarkable figure. He’d been, I think, Secretary of the Interior, in the Hoover administration. And he was a gaunt, tall man and he wore high collars and had an austere personality. So I had some trepidation about having to make this sales pitch to him. And in those days, the President’s office was where the history corner is now and there were no secretaries around. It was just a door, with a piece of glass that said “President” on it. So I went and knocked on the door and I heard a muffled voice say, “Come in.” And I walked in and he’s sitting at the roll top desk so that I got a profile of him and he’s busy, he’s writing. And without stopping writing and without looking at me, he said, “What do you want to see me about young man?” And so I gave him my pitch. He then reached into the cubby hole on the desk, pulled out a checkbook, wrote me a check for twenty-five bucks, turned around and looked at me and handed me the check to say, “Good luck, young man!” Those were the days. [laughter] And so I raised the twenty-five hundred bucks. I: So talk about the tournament itself – the National Championship back at Notre Dame. ST: There’s a very strong element for me that I’m playing in a national event, and I’m playing for Stanford and I’m with that team and with those teammates and with Eddie Twiggs. It was a mystical experience for me. When I talk about mystical, it was that my golf game fell into place.. I would have thought that if you ranked me in that setting of those 64 players, I’d have been down about 25, but the fact is that I could play and I played very well. I got into the finals and I played Manual Delatorre from Northwestern. His father was the pro at North Shore in Chicago – a very prominent teacher and Manual obviously was a very strong, good golfer. I shot 69 in the morning 18 and I eventually beat him in five and four. And I have to say I think I saved Manual’s career. He became one of the leading teachers in the country. Instead of going on the tour, which he was planning to do, he turned his life to teaching, and the reason I think I saved him was because when I could beat him five and four, he knew that he didn’t have a chance out there. I: Would you say that was the highlight of your playing career as a golfer? ST: Oh, without any question. It had all those dimensions. I had one other experience that I can talk about briefly that ranks somewhat near it, but it was, all things considered, truly a permanent life enhancer, and added to the whole impact was getting on the telephone with my father and saying, “Dad, I won.” Neither of us could speak thereafter for a long time. From my perspective, there can’t have been a better time to have been at Stanford. It was clear when the war came, it was never ever going to be the same, and it was a consummately wonderful, literally beautiful experience for me. Golf was a feature of it, but there was so much more than that added considerably more to whatever I became. I: You have spoken about how much golf has contributed to your life. I have to say that your life has contributed a very great deal to golf, as well. ST: That is a generous thought. I recognize that I have that reputation for which I’m humbly grateful, but I am certainly conscious of the fact that nothing that I’ve ever done in golf has been anything other than intensely satisfying on a personal basis, and if you add up the balance sheet in terms of what golf has done for me, as opposed to what I’ve done for golf, it isn’t even close. I’m grateful, very grateful for the perception, but much more grateful for the fact that, whatever role I have had, that I still have now, involvement in and playing the game are priceless assets. I: Well, I think it’s much more than perception, Sandy. ST: I’m grateful for that thought. Are you interested in Oxford? ST: Okay. The Rhodes Scholarship had been put on hold during the war and it got revived in 1946. The competition occurred and it frankly had never really occurred to me that I could be a Rhodes Scholar. And it so happened that I was with a friend in a taxi cab in New York, and he said to me, “Did you know that that the Rhodes Scholarship was going to be revived?” And I said, “No.” And he said, “Well, it is.” And he suggested that I apply. I said to him, “You know, okay, well, what have I got to lose?” If he hadn’t suggested that I apply, it would have never occurred to me. In any rate, I applied, and to my consummate surprise was selected. What an incredible experience that was. Two years at Oxford and here again comes golf. Boy, did it ever figure in that experience. The Oxford system functioned, and it still does, on the basis that it was a tutorial system. You seldom went to a lecture. You had 8 weeks at Oxford in the fall, 6 weeks off at Christmas, 8 weeks and then 6 weeks off in the spring and 8 more weeks and then three months in the summer. With the idea that your tutor was to direct you, you weren’t supposed to get the education handed to you, you were to go and get it. And then of course it was a wonderful adjunct to the education that I had where so much of it had been fed to me. ST: Well, you know, I had a marvelous intellectual experience, but the expansion of my horizons was very significant in that Oxford, obviously being world-class, also attracted students from around the world. The Student Body was remarkably diverse. And the whole scene, the historic aspects, it was thrilling, literally. The intellectual side of it was very stimulating. The tutors I had were so impressive. I read for a bachelors in law degree and the way the system worked, you had two years of study and then at the end of two years, you had 8 days of excruciating examinations on what you had accumulated. And two of the examination papers were in Roman law, and the questions were in Latin. What they did, they quoted sections from the Justinian Code in Latin and asked you to comment on them. In junior high school, I had had one year of Latin, but that’s all I had. And what I did, I just carried with me wherever I went a pony that had on one side the Justinian Code and on the other side the translation. And I worked at that so very hard, that I could really recognize effectively the English translation of the Latin, so I got through those two papers okay. It was certainly impressive that Balliol college had an underground that took Jewish academicians out of Hitler’s Europe, and among the people who were in that underground was the premiere Roman Law scholar in all of Europe. He was my tutor, and here he’s just got a kid that’s had one year junior high school Latin. He was wonderful. So, I had that experience. But then there was golf – my goodness. The only University match we played was against Cambridge, and otherwise we played club and golf society teams around the area. There were a lot of them. We played every Saturday, every Sunday in the fall term and in the winter term, starting in October right through the winter, to the end of March. And that added another dimension to my approach to golf. Weather could not matter less to me. You just got used to the fact that you were almost never to play in anything but uncomfortable circumstances. For example, we’d play say Suningdale. So we got on a bus in Oxford at about six o’clock in the morning, or 5:30, and when we get to Suningdale, the team that we were going to play would greet us, and we would all sit and have some coffee together. And as I observed in most of the clubs, when we did this, there was a designated old boy who went and reflectingly looked out into this terrible maelstrom that was going on outside and say, “Oh, I say, I think its lifting.” That was signal, and out we went without regard to how lousy the weather was. That expanded my horizons hugely, both with regards to golf but also with regard to the people to whom I was exposed. Those friendships that I made at Oxford, but particularly the golf friendships, and the associations I have with the Royal and Ancient Golf Club are horizon expanders. Bernard Darwin was reporting on our matches. In those days in the UK, amateur golf was a very important game, and there wasn’t a lot else going on. It was post-war, and was tough, but we got a remarkable amount of exposure. It was something else. I: England must have been just trying to find its feet and heal its wounds, recover its stride again in 1948 after all the trauma of World War II. It must have been really something to be there. It wasn’t the normal quiet time I would think. ST: It was anything but. It had a lot of depravation and a lot of terrible weather. A shortage of coal. Rationing, the rationing was really severe; two pieces of lousy meat a week, a couple of eggs. They just shoved in whatever else they could find. London was chaotic in terms of what had happened to it. But there was a countervailing factor that overwhelmed that part of the problem. And that is - two things: individually we had survived that war and collectively what we had done was to save the world, as we visualized it. Without any question, and we’d done it together. So the synergy between us was really wonderful. Apropos of that, I was the only American that ever played on the Oxford golf team up to that time. There have been several since, but I was the first one. We spent Saturday night in some member’s house - they spread us around – and then we were to play at another club the next day. The host would go down to the cellar and get the wine he had been keeping for some very very important occasion. He had an American as a guest, and he wanted to be able to express gratitude by giving something he cared a lot about. ST: Then again this is right up there close to the NCAA win, but nothing will ever match that triumph for me. They had an international intercollegiate at St. Andrews and it was called the Boyd Quaich. The Quaich is a Scottish drinking bowl. The Boyd family had two Boyd brothers killed in the war, and one of the ways… They were both avid golfers, as was the rest of the family, and one of the ways that the family memorialized them was to persuade the University of St. Andrews to be the host, at St. Andrews, of an international intercollegiate. It certainly had a broad-based field from the U.K. In those days there wasn’t a lot of golf in Europe, but it had Europeans and it also had some Americans. It was 54 holes, stroke play. First round on the Old Course, the second round on the New, wonderful, and the third round on the Old Course. And I won it. I shot 217: 72, 73, 72, and in the circumstances those scores for me were inexpressively satisfying and I, therefore, won the Boyd Quaich. And, boy, in a setting like that, at St. Andrews … I got a little model of the Quaich, which I treasure. The Quaich itself is a large bowl and we had a dinner celebration, which was wonderful. They filled that Quaich with port and passed the Quaich around and we all took a drink until all the port was gone. That added a lot of frivolity to the atmosphere. I: A lot of color. I: Made the haggis a little more palatable. ST: No, nothing can make haggis palatable. Maynard Garrison was then at Princeton, and he and a Princeton friend were over there and they were playing in it. Maynard and I were paired to together in the last round. That’s how I came to know him and it was a significant introduction from my point of view. I: I’m just noticing up on the wall over here – there you are – 1942, you and Brownell in the stroke play at 146 to qualify, and Traphagen was at 147 and McCann was 152. I: It looks like you tied with LSU. I: And there must have been a play-off? ST: No, we were co-champions. I: Now, fast-forward a bit. At the same time, perhaps, as your successful law career was unfolding, you developed an association with the USGA and eventually became President. So could you speak about how that process took place. ST: That’s another mystical development in my life, without any question. It developed because I had become a member in the Cypress Point Club and Jack Westland was a member. Jack Westland was then and still is, I think, the oldest person ever to win the U.S. Amateur Championship. He was 47 when he won. A very good golfer, and he had been on the Executive Committee of the USGA. I just can surmise now, but I believe that, without saying anything to me, Westland thought I could be useful and he so identified me. A past president came to me and said that they thought that it would be useful if I went on the Executive Committee. I took a look at my life at the time, both economically and in terms of my law career, and I couldn’t manage to do it. So with a great deal of reluctance, I passed it up. Incredibly enough, about 10 years later, they came back to me. By that time, I was able to organize and handle it. So, I got on the Executive Committee in 1972. And I had eights years and, boy, they were wonderful. Being involved with the governance of the game and then to end up as the President was a life expanding experience. And almost as important was that I was on the Championship Committee for six years and I was Chairman of the Championship Committee for four of those years. In those days, the Chairman of the Championship Committee set up the Open golf courses. And we had something to do with the course selection. So, I had two years of experience as a member, and four years as a Chairman, setting up Open golf courses. How fascinating that was! As you may not know, the 1974 Open at Winged Foot was a watershed Open. I loved that golf course and I had the very strong sense of what we needed to do to identify the best players in the world. We couldn’t do that without giving them an effective challenge. I participated actively in the set-up of Winged Foot. I think the average score the first day was about 78. You would have thought an atom bomb had fallen on the place. In those days they there were terrible tensions from the player’s side; the players literally thought what we were trying to do was to humiliate them. The atmosphere was very pyrotechnic. At he end of that first day was the setting in which the media got to me with a great deal of intensity, effectively indicating that the players had a hell of a lot to complain about on this lousy, rotten, miserable set-up that had humiliated them. And it was then that I said, which was a spontaneous, but understandable reaction, I said “No, we are not trying to humiliate the best players in the world, we are simply trying to identify who they are.” And that was what we were doing. A fellow named Schaap, I can’t spell his name, but he wrote a book called “Massacre at Winged Foot”. The happy fact is that I didn’t have any questions about that set up. I thought, if you want to be among the best players in the world, you ought to be able to handle this golf course. There isn’t a hole in which you couldn’t make a birdie if you played it as well as it could be played. And if you don’t play it well, then you are going to have a tough time. So go play. And it was watershed, in the sense that that set the premises for Open course set-ups to this day. I: Is that the one that Billy Casper won? ST: No, Hale Irwin won that. I: I am sure your knowledge is much more direct and insightful than mine, but I’m remembering a tournament at Winged Foot where Billy Casper, on all four days, played short on that long par 3 on the front 9. I have forgotten which number it is, 6 or 5, and he deliberately played short because there was so much danger around the green. And he pared it all four days and the players who finished second and third bogeyed it at least twice, or something like that. So his course management was unusual, but superb. ST: He had it, alright, no doubt about that. I: Certainly in reading over the years about Stanford golf, your association and relationship with Tom Watson comes up repeatedly. Could you share with us some of how that came about? ST: Another dramatic illustration of how golf has enriched my life. The relationship I have had with Tom Watson is soul satisfying, let’s put it that way. The background is that when I was an undergraduate here, his father was in business school. His father was a very good player with a somewhat flamboyant personality and was easy to identify and attractive, so that I just got interested in him. I didn’t know him very well, but I was interested in him because he was effective in so many ways. So when Tom turned up here, the name registered. I followed him with a good deal of interest. I didn’t make any particular contact with him, although we communicated from time to time. But what really triggered the relationship for me, what it became, was the ’77 Open in Inverness where Tom was playing. I don’t remember the circumstances, but I do remember that we were socializing in some way and he said “You know what, Tatum, we should play together in the Crosby.” And that did it. I played with him every year, either as his partner, or - there was a fellow by the name of Bob Willits and we alternated playing as Tom’s partner. For those alternate years, Tom would set up another pro partner for us, and we would therefore be playing as a foursome. So, I had the unique experience of playing as his partner or, in alternate years, playing in Tom’s foursome with another pro Tom selected, right through all his glory years. Wow! I: What did he say to that? ST: He just chuckled. He wouldn’t necessarily initiate conversations, but he’d talk to you and you’d have some socializing involved, but boy when he stood there and composed the golf shot and picked his golf club, there wasn’t anything more intensely effective than Tom Watson organizing to play that golf shot. A characteristic that I have to say I think is the basic fundamental reason why Tiger Woods and Jack Nicklaus and Tom Watson are better than anybody else. They have a capacity to focus, and eliminate all of the intrusions. And he had it, and it was fascinating to watch it develop because he’d be relaxed and walking along and all of sudden, as he approached the shot the isolation was total. I said to him one day, “You know, Watson, we ought to use you as a cancer cure because you’re positively radio-active once you get over that ball.” It was truly how I observed him. And, boy, could he putt. And furthermore, every putt he had, he worked at it to make it. I don’t care how tough a putt it was. And he made a lot of them. When he missed they all went three feet past and he nailed them coming back. He was wonderful. I: I was a graduate student in business myself here when he was graduating and playing golf on the team, and I remember a round, I walked around with him one day and two holes stood out. Number 6 he hit a quick hook into the trees and had a shot that I didn’t think was playable, but hit it straight up in the air from about 110 yards to 10 feet, rolled it in for a birdie. To me it was an impossible shot. He was four under going into 16 and hit the worst drive I’ve ever seen on 16, about 70 yards right, straight out of bounds. Then he proceeded to hit a driver and 3-wood to 30 feet and rolled it in for a net par, and finished four under. So he had a looseness to his game, but there was brilliance. I: Dornoch still remembers Tom very fondly. ST: Oh, everywhere he went. I: But I mean even now. ST: Oh, absolutely! And apropos, we played in very very tough weather and we were coming in about 6:30, walking up 18 and he said to me, “Come on, Tatum, we haven’t had a private game. Tell you what we do. Send the caddies home, and tell them to come back in a half an hour and let’s go out and play.” So we did, and therefore we got started out about seven o’clock. And all day, basically, wind had been blowing, it had been raining. We were walking down the third fairway and I was walking along behind him and he stopped, and he said, “Tatum, I’ve got something I want to say.” And I said, “What do you want to say, Watson?”. He said, “What I want to say, Tatum, is that this is the most fun I’ve had playing golf in my whole life.” Okay? That was Tom Watson! I: That would be a course on which you would be likely to say that. ST: Absolutely, and in those weather conditions. I: I remember Watson being asked what is the most difficult shot on the golf course at Dornoch? And he’s reported to have said, “the second shot on the second hole”, if you remember the hole. … and long is no good either. ST: That sounds like it. I: I want to take you back and then you can bring it forward for a second if I could. Just reflect on what your Stanford experience has meant to you. Not just the golf, the experience of being a student here -- did you go to law school here as well? ST: Yes, I did. I’m stopping and thinking for a minute or so, because it’s very hard for me to be able to express it in a way that satisfies me that I get across how much it meant for my life, in two respects. I had the four years as an undergraduate and one consummate life. Intellectually, it woke me up to huge horizons. The student body was made up of people that were very very interesting. The atmosphere in the place was so conducive to learning and enjoying. The intellectual life, therefore was very satisfying and the social life was very satisfying and, of course, the there was the factor of golf. But basically, it would been a perfectly wonderful experience even if I had never picked up a golf club. The academicians that were here, every single one of them, to whom I was exposed was an inspiration. And I got the intellectual foundations and the other foundations that helped to develop me as a decent human being. I: Would you like to say a word or two about Tiger? ST: I certainly would. He hasn’t yet reached the point of being the greatest player in the game simply because in order to acquire that title, he has to have a record that is competitive with Nicklaus’ record. That takes some longevity. There’s a factor there in terms of time of playing at the top of the game, that Tiger, in my judgment, needs to accomplish. On the other hand, I think there is a perfectly understandable point of view that he is the best player who’s ever played the game. There is a combination there, isn’t there. I mean, after all, it becomes hard to believe, you’ve seen the videos when he was three years old and see the golf swing, it’s pretty much the same golf swing that he’s got today at age 30. The way in which he has developed. His father, we ought to have a memorial to his father. Contrast his development with that of Michele Wei. Perfect contrast. Furthermore he has all the other credentials, as I see it. He knows the game and he’s a very interesting, very intelligent human being. He comports himself impressively, I think, other than except for the occasional expletive, which is understandable, but I have enormous respect for him as a person. And as I say, I think you can identify him in terms of being the best player who’s ever played the game. That is to say his ability transcends anybody else’s ability, as I see it, but that doesn’t qualify him as the greatest if all time, for reasons that I have identified. And you know, golf happily and understandably has the truly great players identifiable as really interesting and effective human beings as contrasted with other sports. I: Can we ask you one more favor, Sandy, I don’t know if we’re quite through, but while it’s on my mind, in terms of this enterprise that you are participating in with us today, we would hope that we could have a conversation like this with Tom Watson, or with Tiger or with some of the other people who you have been close to. Could we call on you to help us facilitate that? ST: Oh, absolutely. I would expect Tom would be delighted and even go out of his way. I don’t have access to Tiger, but I’m trying to get it, as a matter of fact. And this is an aside. In the Don Kennedy administration - I had always been frustrated by this golf club. II don’t mean to be critical of anybody, I’m only recording the facts. A golf club superimposes itself on golf at Stanford, so that this golf course doesn’t nearly satisfy Stanford’s needs, so that students, faculty and staff can get effective access to it, and so Stanford can use it for all the things that Stanford can use it for without the imposition of the golf club. That’s beginning to be rectified, as you probably know, but it will take many years. Now this goes back to the Don Kennedy administration, and playing here frustrated me as a student because it wasn’t all that easy to get on the golf course. So, I got the idea, and got Tom Watson involved, that there be two golf courses out in the 280 corridor. There’s a 1,200 acre triangular piece that’s bordered on the east by 280 and on the west by Alpine and on the south by Arastradero, and the intersection between 280 and Alpine is where the apex of the triangle is. 1,200 acres there. The concept was that we would have two golf courses, one would be for Stanford students, faculty, staff and alumni. Any time left over they could sell, and depending on how Stanford wanted to deal with the money factor, there would be a public golf course with the economic factor being, how much Stanford wants to make. They could make a lot, in my judgment. A really first-class golf course in that setting, in this environment, I don’t know what you could charge. And it was perfectly clear that I could raise the money, that is Stanford wouldn’t have to invest a dime. All they’d have to do is permit us to use that property. On the basis that if some other use came along, it would be effectively available. The only thing it is now used for is occasionally to run cattle. Nobody sees it. Tom and I worked out roughly the routing for it both golf courses. And we’d have a state of the art golf academy utilizing all of the technology, and Tom would design that. So, I got that going, and the Board of Trustees was on board, Don Kennedy, the President, and the provost were very enthusiastic. And I had two committees: a policy committee and working committee and we were well along. The working committee went all around and looked at all of Stanford’s lands and came to the conclusion that that was the very best place where we could possibly have that kind of a facility. It was going to happen, until the government affairs people came along and said we can’t handle that politically now because we have Sand Hill Road. So, it’s been on hold ever since; they put it on hold. I’ve made some runs at it. I made a run with Gerhard Caspar and got nowhere and I finally now have revived it - I got Spaeth involved, and we’ve come up with the idea that the golf courses would be designed one by Tom and one by Tiger. And you know, wow! And there’s no question about Tom, but getting Tiger, somehow I’ve got to work out a way, hopefully I can manage to do that. I: Have you talked to Conrad about that? And I know how much it could matter, because Tom did six of those, and he is so good at it and so impressive and so attractive in all respects that they were very very successful events. He’d put on a clinic, we’d have lunch, we’d play golf, we’d go to the President’s house and have cocktails and dinner and out of all that, well, well, over a hundred million dollars was raised for Stanford. ST: Oh, I’ll say. And apropos, the development people, Tom Ford, he said, “You know, Sandy, one of the real frustrations we’ve had, we haven’t been able to get to Tiger. I think this is an access to Tiger, let’s go for it. Well, I hope I can get to the point where I’m sitting across the table from Tiger asking him if he’d do this for Stanford, against the background, as you probably know, where the first golf course he’s doing is in Dubai. His fee is $26 million, plus 10% of the action. Well, Dubai is unreal, just in general. His second course is in North Carolina. His first one in the U.S. I: Is there anything else that you’d want to add across the range of topics or personalities or teammates or experiences that you’ve had? ST: No, I think we’ve covered it as effectively as I can. I do want to say that I think what you’re doing is wonderful. I think there’s a legacy here that needs to be identified and it involves, obviously, extraordinary combination of the institution and people and the game, and it’s wonderful. And thank you very much! I: Thank you. It’s a privilege to be part of this project. ST: I’ll bet it is. I: Sandy, as I was listening to you talk about these wonderful plans for more better golf here, I was thinking of the dark side of that, and that is the two near misses of the near destruction of this golf course with this idea of housing on the first fairway, and then the trails running through the back nine, which would have essentially destroyed the back nine, certainly as it is now. ST: I understand that. The answer is that one of my basic motivations was the absolute conviction, in my judgment, that this golf course was going to go. I wouldn’t cause it to go, but it’s going to go. And my understanding was that when the golf course was put in, the understanding was that one day, particularly that first seven holes, would be converted, primarily for faculty housing,. So it was always a kind of temporary, and it’s still in that posture, and I can assure you that we’re still in that posture. The communications that I’ve had – it’s what is wrong, witness Condoleezza Rice’s proposal - the business about the first fairway. And so that leaves me totally comfortable that I’m not going to be responsible for the death of this golf course, but I’d like to be responsible for making golf much much more useful to the university than it is here now.